Messrs. Editors :—This work is partially closed by ice, and whether the officers will break the ice and endeavor to keep it open as long as possible, remains to be seen. Although some of the divisions are well provided with icebrakers, the officers in charge have made no preparations to use them. 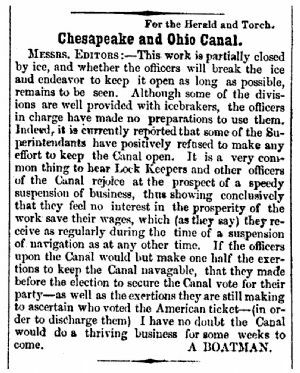 Indeed, it is currently reported that some of the Superintendants have positively refused to make any effort to keep the Canal open. It is a very common thing to hear Lock Keepers and other officers of the Canal rejoice at the prospect of a speedy suspension of business, thus showing conclusively that they feel no interest in the prosperity of the work save their wages, which (as they say) they receive as regularly during the time of a suspension of navigation as at any other time. If the officers upon the Canal would but make one half the exertions to keep the Canal navagable, that they made before the election to secure the Canal vote for their party-as well as the exertions they are still making to ascertain who voted the American ticket—(in order to discharge them) I have no doubt the Canal would do a thriving business for some weeks to come.